• Storage box with secure lid to ensure content stays safe. • Suitable for stacking to save storage space. • Popularly used for keeping paperwork tidy and organised. • Manufactured from durable strong clear plastic. 30 Litre plastic storage box comes with lid to enable you to make sure your content is kept safe once stored. 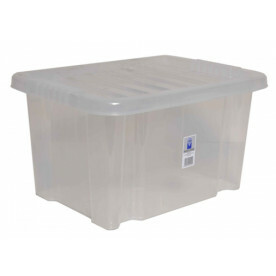 Our 30 Litre plastic boxes are the perfect size for stacking paper neatly and securely away. This keeps your paperwork in order, together and neat. 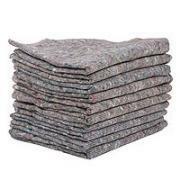 Suitable for stacking and recyclable. These are what you expect them to be. The lids fit and the boxes stack easily. Promptly delivered . This was my second order and the boxes are great-really strong and good value! HOWEVER, my first shipment was missing a couple of parts (lid and clip) After THREE requests and hearing NOTHING back I am wondering if I will ever get the missing parts! Customer service obviously isn't top of the list! I needed to find a container to fit into a certain space. Your range of products was impressive and gave clear all round dimensions of the box. Good quality product at a realistic price. Whilst this product was part of a multiple order,one item was out of stock,which led to a delay in dispatch. I was very pleased with these boxes. They arrived very quickly and are a sturdy product, excellently priced. Delivery was prompt, Boxes were excellent value and quality.